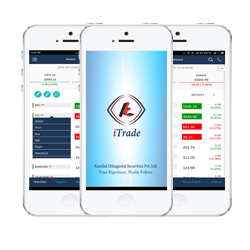 Multi-exchange internet based trading application. Compact easy to deploy self-installing kit. Streaming quotes for continuous rates refresh. Integrated Net Positions View with Multiple Filters. Order entry screens for quick order entry on multiple exchanges. Facilitates Order and Trade book functions with fully customizable views at all levels. Download for Android available at Google Play. Download for IOS available at App Store. Customized AMC Scheme to reduce cost of your trade. Advantage of mobility - Access all your account from anywhere; home, Office, Cyber Cafe, Laptop. Integrated back office - Access all your information at anytime from anywhere. Integrated banking, De-mat and Trading account with digital contract notes. After hours order placement facility. Research reports (Fundamental & Technical). Intra-day calls & flash news. 24X7 web enabled back office.